[Every animal, every creeping thing, and every bird, everything that stirs on earth] emerged from the ark by families (Genesis 6:18). R. Yochanan said, “With their families, not by themselves.” R. Chana bar Bizna said, “Eliezer said to Shem the Great, ‘It is written, emerged from the ark by families. You yourselves, where were you?” [Shem] said to [Eliezer], “We had great trouble in the ark. Animals that were accustomed to being fed by day, we fed by day. Those normally fed at night, we fed at night. My father did not know what the zikita ate. One day he was sitting and cutting up a pomegranate when a worm dropped out of it [and the zikita] ate it. From then on, he mashed bran [in water] and when it became wormy, [the zikita] ate [the worms]. The lion developed a fever that sustained it—for Rav said: Fever sustains no less than six [days] and no more than twelve [days]. [Concerning] the avarshinah, Father found it lying in the hold of the ark. He said to it, ‘Don’t you want food?’ It said to him, ‘I saw that you were busy so I said [to myself] that I would not trouble you.’ He said to it, ‘May it be [God’s] will that you never die.’” As it is written, I said I would end my days in the nest but be as long-lived as the phoenix (Job 29:18). 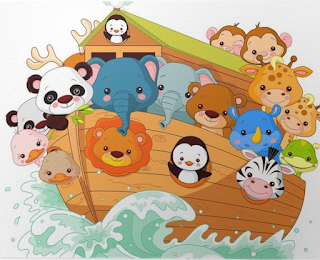 Graphic representations of the Ark generally depict the animals standing on deck—the ark had no deck—and smiling like people embarking on a pleasure cruise (see graphic on the right). However, there is nothing in the Torah’s portrayal of the Noah story to suggest this. With thousands upon thousands of creatures shut up in the ark the conditions inside must have been stifling and miserable. Imagine only eight people to feed and care for them all. All this amidst a genocidal hurricane covering the earth. Why would anyone smile? The Rabbis wondered what it must have been like in the ark and what would have been required to sustain life for the year they were all shut in before they finally disembarked. Shem then provides an account of life on the ark. His first point: It wasn’t easy. First problem: feeding schedules were difficult because some animals are diurnal and some are nocturnal, and all were to be fed according to their biological needs. Therefore, the people needed to adjust to the animals’ schedules. Second problem: the people didn’t know what food each and every animal required. Shem recalls that a creature called the zikita was a case in point. (While I don’t know what a zikita is, others have offered suggestions ranging from chameleon to bird.) The point of Shem’s anecdote is that Noah kept his eyes open and was able to learn, by watching the zikita, what its needs were and then innovate a solution to produce its food. Third problem: the preferred food of some animals was other animals. This was a non-starter given the purpose of the ark was to serve as a genetic safe. However, heaven helped by making the lion feverish enough to lose its appetite for its usual prey but not so sick that it died. Then Shem recalls the avarshinah, which the Talmud identifies with the phoenix based on a verse from Job, but we don’t honestly know what animal it is. Up until this point, the Talmud has impressed upon us the compassion the humans had for the animals in their charge. According to Shem, the avarshinah repaid Noah’s compassion by displaying compassion for him. It recognized the weight of Noah’s burden in caring for the animals and did not want to trouble him further about its own care. When Noah discovered this, he blessed it with, if not eternal life, then long life (Job 29:18 can be read either way). This whimsical account of life onboard the ark emphasizes that compassion displayed under duress can make an enormous difference in the quality of life—and promotes survival. Shem’s anecdotes highlight four themes: (1) discerning and meeting the individual needs of others even when it causes you great difficulty; (2) learning what others need even when you don’t know; (3) God’s help when things are difficult; (4) receiving reciprocal compassion from those you care for. Why do you think the Rabbis chose these four themes? Would you have chosen or added others? How do these themes apply to your life? Do you believe that only human beings can feel and express compassion? Here, the Talmud asserts that animals are capable of discerning human needs and displaying compassion toward them. Do you agree or disagree? What has been your experience? Is there a message here about how we should treat domesticated animals and wildlife today? If so, how does this apply to conditions in zoos? How does it apply to our effect on the habitats of wild animals and their food sources? How does it apply to global warming and its effect on habitats and food supplies?